Welcome to the second installment of our series, Get Inspired. We’re showcasing stories of next-level design and features created on Wix websites in combination with 123FormBuilder. Businesses build and strengthen their audience by telling a story that sparks curiosity while remaining relatable to customers’ goals and struggles. If you’re a marketing agency, your task is to help your business clients articulate their story and make sure it is seen and heard in contexts where interested people are waiting. It’s simple in concept, an ongoing challenge in practice. Hello Story is a marketing and content agency that helps businesses communicate their stories so that they can focus their efforts on their core products and services. Because tales of their past solutions may not be especially meaningful to new leads from different industries, Hello Story must ask for visitors’ stories rather than tell their own. The agency teamed up with an expert at 123 Form Builder – David @ SSG Web Services to create a 2-minute content marketing health check on their Wix website. It’s an amazing way to get a conversation started and give customers an immediate idea of the areas that need development. At first glance, the form looks extremely simple. That’s because the advanced functionality actually lives after submit. Based on the visitor’s feedback on existing content marketing efforts, the system creates an easy-to-use chart identifying opportunities to reach people through content. Has Hello Story got you inspired to drum up new leads through your Wix site? Sign up for a free 123FormBuilder account and start experimenting with clean, standards-compliant web forms. No coding skills required! 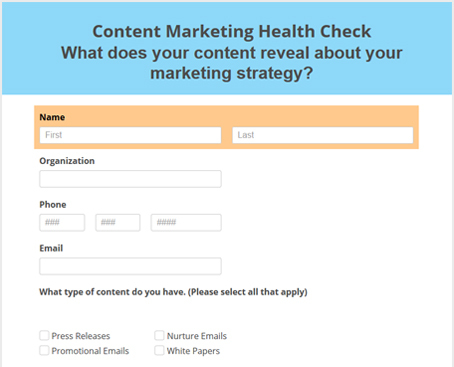 Want to leverage autoresponders like the content health check? Hire an Expert to build it! In order to create the attractive charts, Hello Story worked with a Wix/123FormBuilder expert. Once it’s up and running, any 123 Form Builder paid plan can host your similar form with unlimited live support and no visible 123 Form Builder branding. Get in touch with our experts today and plan a form that will produce results without headaches!